You never get a second chance to make a first impression. The 10mm Auto cartridge combines effective terminal ballistics and large magazine capacity in a self-defense handgun. Operating at slightly higher pressure than the 40 S&W, the 10mm Auto case holds significantly more propellant and consequently generates significantly higher kinetic energy at the muzzle. Using a 5” barrel, the 40 S&W 180gr JHP will have a muzzle velocity of 1119 ft/sec while the same bullet from a 5” barrel 10mm Auto will exit the muzzle around 1351 ft/sec. But as they say—there are no free rides in life. A good way to experience this is to shoot a full-performance 10mm Automatic cartridge out of a 1911-style handgun. The narrow backstrap of the gun increases the pressure in your hand from the recoil. This is where the double-column semiautos like Glock are advantageous. The wider backstrap of the pistol is harder to grip, yes, but the recoil is distributed over a larger area, so it might not hurt you to shoot it. While I highly recommend the 10mm Automatic for self-defense, I must tell you that it is only good for pistol shooters who are willing to practice frequently and who want to improve their shooting ability. I am fortunate in that people ask me for my opinion on what gun they should use for concealed carry. It is useful for one to take a look at their lives, in private reflection, and decide honestly what level of threat they face. Let me explain. There are many great defensive technologies out there: firearms, martial arts specializing in knives and wrestling, bullet resistant vests and cars, perimeter lighting, good fences and razor ribbon to name a few. A common theme about physical security : you have to pay attention all of the time, the attacker only has to get lucky once. Please think about that for a moment. Criminals set the time and the place of the fight and if the ‘good guy(s)’ are lucky, they will have a chance to react to the attack. Translating this to the world of the ‘average person’ who is concerned about Concealed Carry Permits and shopping at their local, organic, grocer or picking their kids up from school, the same calculations apply. What activities do you engage in? Do you publically engage in politically-oriented speech? The questions are obvious but it pays to be honest with yourself. What I am saying here is that for most people, having a gun and the will/ability to use it is sufficient. Lots of the people that I have spoken with are combat veterans. Some of them carry no weapon at all, some of them carry a full-size pistol and a knife that they practice with regularly. It’s a matter of personal perspective and lifestyle. To help bracket the discussion of “how much security is enough?”, consider the case of Alfred Herrhausen who was killed inside of his armored limo by an explosively-formed penetrator bomb. Despite having bodyguards in his three car convoy and an armored vehicle, he was still killed. This case is an example of a very high risk target. My thinking is that if you are involved in a business that handles a lot of cash or you have access to drugs that drug abusers may want, I would highly recommend that you put in the work and get the professional training to learn how to shoot a 10mm Auto, 45 ACP or 357 Magnum effectively. It’s a fairly large commitment but your life is worth it. 10mm Auto is advantageous in terms of ammunition selection. You can buy light loads that are ballistically-equivalent to the 40 S&W and heavy loads that are superior to the 44 Special. The challenge is in finding bullets that hold together at the higher velocities. Verification of which bullet is which can only be obtained through live-fire testing into ballistic gelatin. 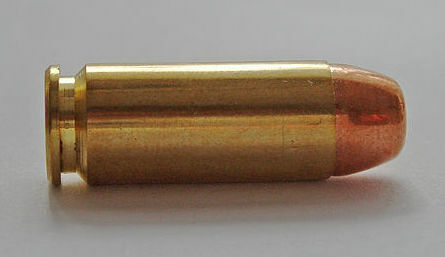 Jacketed hollowpoints are recommended for self-defense. I would recommend the 155gr bullet—as long as that bullet holds together upon impact. Interesting with this caliber is that the heavy bullets with a flatnose profile may be useful for self-defense against dangerous animals like bear. So depending on where you live, a simple change of ammunition will allow you to defend yourself against two– and four-legged predators.